The Kininvie stillhouse sits between Glenfiddich and Balvenie, and stylistically the whisky is a midpoint between its two sisters. It has its own dedicated 10,000 liter mashtun in the Balvenie mash house (though it doesn’t use any of that distillery’s floor-malted barley) and its own tun room as well, with three new washbacks (out of six in total) being installed at the time of writing. The stillhouse, often rather cruelly dismissed as no more than a shed, contains nine stills in three sets; one wash to two spirit, the spirit stills being roughly similar to Glenfiddich in shape and size, the wash stills being tall and onion shaped. The cut point is high, thereby avoiding getting heaviness from such small stills.Aging takes place in a variety of woods: first fill bourbon (predominantly for Monkey Shoulder), refill, and some sherry. 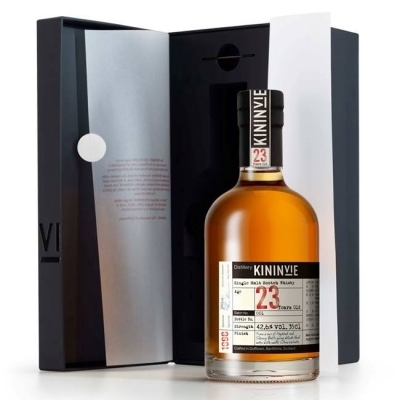 When you compare its new make to Balvenie, Kininvie is on the floral side of the spectrum (think geraniums), lighter and sweeter with less thickness on the tongue, lower vanillin and cereal, but a more lifted, estery fruitiness, and a long silkiness on the palate. It is this mix of flowers and fruits which predominate in Batch Number One. Bright gold, the nose immediately offers up fruit blossom, wild flower meadow, sugared plums, and an old-fashioned sweet shop. Water brings out grass and pineapple. The oak is very restrained, allowing the palate to build in sweetness with supple weight, star fruit, white peach, and light citrus on the finish. It’s very Grants, in that there are hidden depths if you take the time to look, yet is substantially different from its siblings.